Eleven years has passed since the Bali Bombing which claimed more than 200 lives. Indonesia received various awards in its efforts in combating acts of terrorism. Data from Indonesian National Police shows that more than 900 militants involved in acts of terrorism have been captured during the last decade, including charismatic leaders, ideologues, and action recruiters. Nevertheless, there are disturbing developments, namely various acts of terrorism other than bombings, such as mutilation of officers, attacks on places of worship (churches), the killing of priests, and various others, including the wave of anti-government movement by militant activists that are supported by the public through various mass organizations and religious groups. This indicates that acts of terrorism are no longer targeted upon a ‘foreign enemy’ (such as the United States, Jews, and their assets), but targeting more of ‘domestic enemy’ (such as members of other religions or the local government that support the United States and Jewish policy) (Moghadam, 2010). According to the Action Theory, human behavior cannot be separated from the intention to perform the act. Behavior is also affected by culture, and one aspect of culture is belief in religion. It gives an overview of various acts of terrorism in Indonesia for the last 14 years which was performed on behalf of religion. It is understood that acts of terrorism performed by jihadist groups, such as Jamaah Islamiyah (JI) and Indonesian Islamic State (NII), become a form of religious activity (amaliyah) because, unlike regular acts of crime, they are based on religious values and teachings. Thus charismatic leaders such as Abu Bakar Baasyir and Oman Abdurrahman never admitted that the acts performed by activists are considered acts of terrorism or crime (Putra & Sukabdi, 2013). This issue has posed difficulty for social intervention practitioners and officers at Correctional Institutions in handling inmates of this type of cases, namely due to their unique nature, vast networks, and being different to other criminal cases that are based on certain ideological motive. This research aims to study critical areas in changing terrorism offenders’ behaviors used as parameters of effective deradicalization and give input to a successful rehabilitation program for inmates charged with terrorism cases. As the discussion about rehabilitating terrorism offenders will always be linked to the motivation of terrorism, the research will review first the root causes and motives of terrorism in Indonesia in several studies. The studies about the root causes and motives of religious terrorism describe wide-ranging findings and acknowledge no single answer. A number of studies reveal root causes of terrorism such as collective understanding of Quran verses and as-Sunnah (Putra & Sukabdi, 2013), rationalization (Kruglanski & Fishman, 2009; Post, 2007; Lia & Hegghammer, 2004; Sanadjian, 2006; Wolf & Frankel, 2007), low belief in establishing Islam peacefully with high rationalization of violent attack (Putra & Sukabdi, 2014), exclusion (Toffler, 2006), certain social situations perceived (Love, 2009; Post et al., 2003; Post, 2007), and relative deprivation (Gurr, 1970; Rose, 1982; Runciman, 1966; Walker & Smith, 2001). Many studies indicate that the terrorism based on religious ideology engages religious people (Moghaddam, 2006, 2008, 2009; Bandura, 1999, 2004; Kruglanski & Fishman, 2009) and strongly relate to religious fundamentalism (Pech & Slade, 2006; Taylor & Horgan, 2001). As Horgan (2008) describes, there are steps of people’s involvement in terrorism, which consists of a complex process comprising of the following three phases: (1) joining the terrorist group, (2) staying within the terrorist group, and (3) exiting, quitting, or disengaging from the terrorist group whether followed by a process of de-radicalization or not. Some scholars suggest that what moti¬vates terrorists varies according to the level and role in a terrorist organization or network (Victoroff, 2005; Englehart-Kurzman, 2006). Accordingly, leaders or inner-circle members in a terrorist group or network may have different motives, targets and strate¬gies from those of rank-file members or field perpetrators. In general, two psychological approaches are often used to predict the root of acts of terrorism, namely ‘syndrome approach’ and ‘instrumental approach’. Syndrome approach views acts of terrorism as a manifestation of a specific psychological construct that can be identified, such as specific personality type, social background, ideology, and so forth. Whereas instrumental approach views acts of terrorism as a mean to achieve an objective (Kruglanski & Fishman, 2009). The second approach relies on a cognitive process called ‘moral calculation’ which is subjective for the individual, which tries to test whether a way or method will reap more benefits than losses in order to achieve the desired outcome. In relation with this, the phenomenon of focalism arise, namely an increase of subjective attention toward an objective by ignoring other objectives. For example, the desire of perpetrators of terrorism to free their nation from tyranny or defend their religion can defeat his attention to other desires, such as protecting the innocent or fostering religious harmony. The perpetrators of these acts thought that only violence will be able to help them in achieving their objective and capturing the attention of parties which are the target of the attack as soon as possible (Kruglanski & Fishman, 2009). Proving the instrumental approach to terrorism cases in Indonesia, Ali Imron (2007) as a perpetrator of the Bali bombing describes in his book the underlying reasons for his action: (1) discontent with the current government, (2) widespread damages, namely the damage of creed (belief in one Almighty God) and thought, and damage of morality, (3) the expectation of allowing jihad fi sabilillah (physical war), (4) performing jihad obligation, and (5) retaliation against the infidels. Ali Imron revealed that Israel has performed inhumane act toward Palestinians, and also non-Muslims toward Muslims. He expressed this issue as the foundation for his group to retaliate toward those parties which they consider to be hostile to and fight against Islam. Ali Ghufron and Amrozi, other perpetrators of the Bali bombing, also described in a documentary movie, Prison and Paradise (2010), perceived disturbing conditions hence their action were chosen as an instrument. The Bali bombing is my own initiative and Ima’am Samudra … which underlies … obviously there are many… it may be necessary to tell the people… I may have told the story…, that the current society is already…, damage.., damage in every level and aspect of their life. Thus…, we concluded that the defect.., is not damage by itself. In addition to the belief in Allah’s destiny…, there exist…, the masterminds. The initiators are headquartered in the United States. That is clear… in the United States and also in Israel, that in the United States it exist through one organization called ‘suhub yahud’… which they call ‘suhub yahud’…, where this suhud yahud was established in the second half of the nineteenth century with the purpose to create a new world order… Thus, in essence.., verily.., if viewed from their program…, as I said previously through secularism first…, secularization. We are unconscious that through this secularization.., people will abandon their religion. The Hindu will abandon their Hinduism, the Muslims will abandon Islam, and the Christian will abandon their Christianity. Later on…, all religion will only leave its name. If all… religion.., leave its name…, then they will easily control us… This society which has been damaged, can only be faced through small preaching, with this…, by providing advice. It is also emphasized, but it is not enough.., because there must be someone to perform the jihad. Hence… This is the background of the Bali bombing… to be clear… We do not act without a basis, it has been thought through every aspects, both the affect and the verses… it is all complete… God knows everything (Ali Ghufron in Prison and Paradise, 2010). A study in Indonesia by Mufid (2011) points out three roles of radical religious activists that later will link to motives of terrorism: (1) ideologues (9.1 percent), who creates ideas and concepts, (2) middle management or organizers (10 percent), those who are classified into strategist/technocrat, recruiter, trainer/dispatcher, supplier/armorer, and (3) followers (80.9 percent), categorized into foot soldier/action perpetrator, technician, researcher/surveyor/errand runner, transporter, and sympathizer/fellow traveler. According to the findings of this research there are a number of factors that motivate individuals to be involved in terror¬ist acts in Indonesia. The factors can be classified into six motives: (1) religious-ideological, that is to establish ideals of religion-based government or society (the establish¬ment of dawlah Islamiyah or the implemen-tation of shari’ah) where violent or terrorist acts are considered as legitimate means to achieve these ideals, (2) solidarity-driven, that is to express empathy or help fellow believers, especially when they are threatened or become victims in a conflict situation, (3) revenge-seeking, that is to join in terrorist acts as an at¬tempt to retaliate against the enemies for losses (lives or property) experienced by perpetrators or their family, (4) sep¬aratist, that is to achieve a political goal of establishing a sep¬arate state, (5) mob mentality, that is to spontaneously participate in violent or terrorist acts without having any clear reasons, other than to follow others in such acts, and (6) situational, that is to be involved in terrorist acts by forced. Related to the association of roles and motives, Mufid (2011) explains that religious-ideological motives appear in all roles or layers. Solidarity-driven is shown in the organizers and followers. Moreover, revenge-seeking motives, mob mentality, and separatist motives are seen in the followers. Lastly, situational motive is seen in the leaders and followers. The finding shows that religious-ideological motives are found to be the predominant reason that motivates all kinds of perpetrators in Indonesia to participate in terrorist acts. Table 1 describes the roles and motives of terrorism offenders in Indonesia. As for the cause of the acts of terrorism, Mufid (2011) also describes that cases in Indonesia present causes which are collected in the classification as follows: 1. Structural cause such as demographic imbalance, globalization, modernization, social inequality, and social class; 2. Conductive cause such as communication media, transportation technology, and security weaknesses; 3. Impetus, namely personal cause which occurred in the individual level such as sense of mourning or sadness; and 4. Precipitating cause such as provocative events, political volatility, and incidents. Therefore, terrorism in Indonesia is seen to be a cultural issue instead of simply security issue. In relation to the impression of justifying any means which was touched upon in the ‘instrumental approach’ discussion, Muslim clerics or scholars of Indonesia firmly emphasized what is called as ‘principle of distinction’ in Islamic war ethics, namely the separation between combat soldiers and civilians (Shihab, 2008). This principle, clearly meant to protect civilians hence the target of the attack in battle is only the military target and object. Civilian refers to women, children, asif (servant), elderly, spiritual leaders, and prisoners of war. Moreover, Muslim clerics and scholars also state that Islam prohibits the destruction of environment such as cutting down trees, burning homes, damaging plants, and torturing animals. They also mention six requirements and war ethics in Islam which differentiate it from terrorism, namely: 1. clear and honorable objectives; 2. against the fighting forces, not civilians; 3. stopped if the opposition has surrender and choose peace; 4. protecting prisoners of war and treating them humanely; 5. maintaining environment by not killing animals without reason, burning trees, destroying crops, polluting water and well, destroying houses/buildings; and 6. maintaining religious freedom for religionists and clergies by not hurting them. According to these clerics, based on these requirements and ethics, acts of terrorism by the perpetrators which kills and other violent acts with the intention of establishing Islamic sharia, establishing an Islamic State, and making Islam as a guide to life for all Indonesian people (Putra & Sukabdi, 2013) cannot be justified and cannot become a proof of justifying any means or a form of rationalization (Muluk, Sumaktoyo, & Ruth, 2013). ‘Rationalization’, is illustrated as an individual act which explains a controversial behavior by using rational and logical arguments to cover up the real reason for the behavior, or a condition when an individual act defensively and tries to explain the action with ways that are acceptable to other people or appear logical (Wagner, 2008; Niolon, 1999; Philips, 1994; Maddox, 2006; Freud, 1991; Kaplan, Sadock, & Grebb, 1994; Green, 1982; Sterne, 1976; Fenichel, 1946; Fenichel, 1999; Berne, 1976; Freud, 1937). “All type of efforts, through cooperation of various entities, whether in social, psychology, education, economic, culture, human resources, or other related fields, into a continuous process, which aims to rehabilitate terrorism inmates so they are able to be back in society as a holistic individual both mentally, emotionally, economically, and socially, so as to achieve self-sufficiency, productive, and useful to the state and society” (The National Anti-Terror Agency, 2013, p. 7). As a holistic approach, it focuses on character building and developing better mentality in order to have a more peaceful state of mind and favorable attitude to successfully contribute to society. Even though many people are skeptical about rehabilitating this ideology-based type of terrorism perpetrator, Rambo’s (1993) theory about religion conversion proves that humans can experience ideology or mindsets adjustment. Moreover, Rambo (1993) explains that those who experience ideology conversion have undergone seven following crucial steps: (1) context, (2) crisis, (3) quest, (4) encounter, (5) interaction, (6) commitment, (7) consequences. The process has been tested in 300 more participants who experience change of belief or ideology alteration which lead to behavior transformation. Hence, mind adjustment and behavior transformation are possible. As Putra & Sukabdi (2014) argue, two types of intervention are proposed to meet effective transformation process among religious fundamentalists: peripheral routes and central routes. The first focuses on applying positive psychology in developing quality of life (e.g. education, socioeconomic, etc.) and increasing internal locus of control, while the second focuses on ideology and careful interpretations of sacred texts with the assistance of respected clerics using sets of two-way conversations. Since the revelation of extensive terrorist cells of Jamaah Islamiyah (JI) the Indonesian practitioners including government has launched various soft approaches to rehabilitate terrorism perpetrators (Istiqomah, 2011). The soft approach attracts more concern and attention, and is further supported by all components as a cultural strategy, is believed to be more effective than harsh-oppressive style. It is also involving converted JI members who have renounced extreme ideology to influence their fellows to abandon violence, leave their radicalism, and focus more on socio economic improvement (socio-economical jihad). Many practitioners call this as ‘disengagement’ or ‘deradicalization’. As Hwang (in Villarosa & Hwang, 2011) identifies, the following common drivers toward disengagement occur within Indonesian terror activists: (1) pronounced disillusionment with bombing and other factors (roles, mindsets, ideology); (2) development of relationship with those outside the jihadi circles; (3) change of priorities; (4) law enforcement soft approaches; and (5) cost benefit analysis. In term of deradicalization, Istiqomah’s (2011) study describes that in performing deradicalization in prisons, the practitioners in Indonesia provide trust, moral involvement, incentives, and getting in touch with the detainee’s families is part of the main strategy. The most famous success story proving the effectiveness of this approach is that of Nasir Abas, a former Afghan militant who trained the Bali bombers. After his 2004 release from prison, he has been involved in the police’s deradicalization program and helped to track down and arrested several of his former companions. Nasir Abbas has travelled to several Indonesian prisons to visit his former colleagues serving imprisonment for terrorist offences and convinced those to stop violence. Nonetheless, the methods in this soft approach are not smoothly accepted. There are many criticisms along with their implementation. The critiques get their eligible proof by the case of Abdullah Sonata who was convicted on terrorism-related charges in 2006. Within the umbrella of deradicalization, Sonata received furloughs to attend lawn parties and incentives from the police who paid hospital bills when his wife gave birth. Immediately after his 2009 release on good behaviour, he returned to his group and was involved in launching terror strikes to kill the President and other high-profile targets (Istiqomah, 2011). Based on these recent findings, a further study to identify a behavior transformation, critical areas of development in rehabilitating terrorism perpetrators, elements and criteria of successful rehabilitation, and parameters of effective deradicalization in soft-cultural approach is needed. The study will collect opinions from those who are viewed to be successful in changing their behaviors, meaning those who have disengaged from violence and criminal activities. Regarding this, the major outstanding questions to address in this study are: How the Indonesian Islamic terror activists’ behavior changes through the transformation process? What are the critical area(s) of development needed for Indonesian Islamic terror activists to develop constructive behavior and human function in society? What are the key elements in rehabilitating Indonesian Islamic terror activists? What is the criteria of successful rehabilitation for inmates charged with a terrorism case? And what are the parameters of effective deradicalization in a soft approach as a solution in handling terrorism? A total of 43 men between the age of 25 and 61 (mean: 41) participated in this research. The participants were JI members and its affiliates used to declare Abu Bakar Baashir as their leader before they were arrested. Thirty one participants were prisoners, eight had been released, two were found in a court of law not to have supported the terrorist actions committed by their fellow group members, and the last two were Malaysian ISA (Internal Security Act) ex-prisoners (post released). The prisoners were located in two different prisons on Java Island, Indonesia, who were serving from three years in prison to a life sentence. These participants came from a different level of involvement in terror actions and social hierarchy in their groups’ structures, which was from a technical low-ranked role in the group to high-ranked commander. The participants were recommended by many entities such as prison authorities, national police, media journalists, and civil society components because of their achievement in transforming own behaviors and disengaging from violence and criminal activities. Data was collected through a series of semi-structured Focus Group Discussions (FGDs) and interviews during community engagements, gatherings, and visits to prisons, and questionnaire about training needs in three years. The FGDs and interviews were held informally during visits and gatherings when the participants decided to share their opinions, experiences, and stories without note taking or recording, due to sensitivity of issues discussed. The approximately two-hour FGDs were conducted to probe and discuss regarding behavior transformation process, rehabilitation, deradicalization, re-integration to community, and critical areas needed for Indonesian Islamic terror activists to develop constructive behavior and human function in society. FGDs and interviews were performed by an educational psychologist as a prison authorities’ consultant who had direct contacts with the participants, several times per year in various locations inside and outside prison prior to the interviews. Each FGD and interview session was conducted in traditional Islamic custom as being performed in common Islamic communities in order to build rapport and trust between participants and the researcher. It did not use formal language as some of participants used Arabic terms in explaining. Some questions were listed to give directions for FGD sessions and interviews as seen in Form 1. Nonetheless, the FGD and interview questions were not strictly applied in every FGD and interview session due to sensitivity of some issues discussed. Consequently, some topics were removed or not explored such as transformation process, while some other unanticipated topics were raised such as the failure of deradicalization by government or civil society. Further, the participants were given opportunity to raise their own ideas and opinions during these unstructured FGD and interview sessions. Overall during the discussions, the inmates were quite open in answering questions. After FGDs and interviews, the researcher put down some notes regarding the important ideas, concepts, criterions, critical development areas, elements in rehabilitation, and even steps brought by participants to answer the research questions. A list of questions in a simple anonymous questionnaire about training needs also became a tool (Form 2) in collecting data in a prison (29 inmates). Similar to FGDs and interviews, some points of questions were left blank by some participants without any clear explanation. This study used qualitative thematic analysis on participants’ answers, in training, need questionnaire and note taking after conversations in each FGD and interview session. These themes included: behavior transformation process, critical areas of development in rehabilitation, key elements in rehabilitation, criterion for successful rehabilitation, and parameters of effective deradicalization in soft approach. Moreover, quantitative analysis is also performed to identify the frequency of terms and themes highlighted by participants. Data were tabulated in matrices and combined to formulate general guidelines in rehabilitating Indonesian terrorism activists. 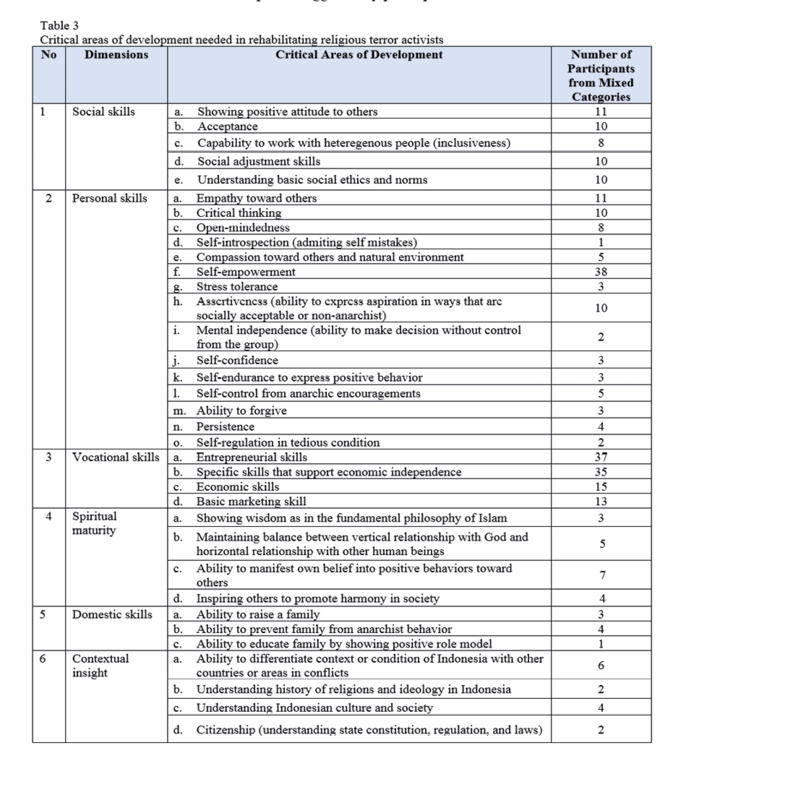 In defining general aspects for critical development areas in rehabilitation, expert judgment was used to categorize developmental areas generated by participants. Further, in analyzing behavior transformation process, Rambo’s (1993) theory about ideological transformation process was taken into account. “The government tries to change us, change our spirit of jihad, using the deradicalization program, they actually don’t understand us and how to improve us” (H, A participant in an FGD). “The brothers have actually changed a lot, we all have changed our thoughts, but not because of the Anti-Terror Agency, but a life process, we looked at the reality” (A, A participant in an FGD). “Changing the jihad spirit is difficult, but changing the behavior by focusing on economic jihad, now, this is important. Still a jihad, but if before it was a physical jihad using arms, now it is an economic jihad, because our children and wives need a living and we don’t want to remain jobless like this. What we need now is jobs and being occupied, so we will be disengaged from violence.” (U, A participant in an interview). “Changing our heart and love for Allah and jihad is impossible, but changing our behavior so we stop bombing is possible, in fact we can” (K, A participant in an FGD). Results show that participants recognize two types of behavior transformation, which are natural and designed by counterterrorism practitioners. According to most participants in FGDs and interviews, the first type of transformation is relatively more favorable and sustainable than the ones designed by government entities or civil society. “There are brothers that have changed since they received the program from the government or foundations, it is enough to create break ups in the movement, those who join the program are despised or excommunicated by the group, there are some that are threatened to be killed, but there are those that change because of life process, maybe they realize that this way of living is not effective, that Indonesia is not a place for jihad but a place for da’wa (education).” (U, A participant in an FGD). “If violence is used to change the brothers let alone the use of torture, it will not matter Ma’am, instead they will be more spirited to perform physical jihad. They just pretend that they’ve change as fiqh al waqi (war strategy), but they will have their revenge later. Instead, those brothers who consistently change are those who found their own self-enlightenment, those who are not steered by anyone, they themselves want to change, because they also see the reality.” (A, A participant in an interview). All participants admit that they experienced behavior transformation process from pro-violence to non-violence. The turning points of the behavior transformation process happened when they were being arrested (70% of participants), finding their kin (e.g. family, friend, significant other) being hunted and arrested by law enforcement (90%), seeing bombing victims (23%), disappointed toward leaders (16%), interacting with law enforcement people with a good attitude (19%), reading inspiring the Islamic book about jihad with the soft method by reputable charismatic ima’am (cleric) (2%), and understanding the contexts of daar al harb (state of war) and daar as salam (state of peace) (98%) as seen in Table 2. The study shows that ideology modification which involves mental adjustment, moral calculation, and changes in choosing strategies to achieve goals is possible. A participant outside prison expresses that he experiences the following sequence of phases in behavior transformation: (1) context in which they believed that physical jihad was relevant in Indonesia, (2) sudden interaction with law enforcement during their arrest, thus creating shock, (3) sudden commitment to follow law and government regulation to avoid maximum sentence, (4) crisis in which he questioned all his strategies to establish Islamic state and review other alternative strategies, (5) questioning if the old strategy of applying physical jihad in Indonesia was appropriate, (6) encountering, in which he performed mental adjustment and modified his strategy to be accepted by majority of Muslims in Indonesia, and (7) gaining consequences in which he received group pressures and rewards from society or law enforcement. Whilst, another participant in prison explains that he experiences another sequence: (1) context in which he lived in special Islamic community where so many JI members became his significant others, (2) questioning whether doing over-camouflages in serial of observations before terror actions were necessary, (3) interaction with law enforcement when captured, (4) crisis, when he saw his brothers were arrested under miserable circumstances, (5) encountering himself that he should change his behaviors and cooperate with police since Indonesia is not in a state of war, (6) commitment to transform own behavior to be more constructive and to refuse violence, and (7) negative consequences he received from his group members and pro-violence religious activists and positive rewards from bombing victims. The other forty-one participants cannot define the detailed process as many of them request to forget the crisis which happened in the past and choose to move forward without being reminded of their past behaviors. “I’ve changed now. Before I still wanted to get my revenge when the deradicalization program was done at the orphanage, but since meeting the bombing victims at the Wisma Makara Universitas Indonesia, I realize that I have to change my way of struggle.” (S, A participant in an FGD). “After getting married I went to Afghanistan, we fought against Russia. I left my wife … The turning point is when I became a “DPO” (wanted by police), I was on the run for 4 years ma’am, when I was detected by Special Detachment 88, I was shocked, but then I say that the officers were kind, there was a professor that gave me his trust, … and during adzan I saw the police break for prayer, I who didn’t want to open my mouth at first, is willing to open my mouth and want to assist the police with the deradicalization program. But while assisting I was still personally confused … I questioned everything. I even still want to stab X (his friend) which I consider as thoghut. But then I personally got my answers, without anyone steering me ma’am. My friends and I now receive threats from our comrades that don’t like our decision of helping with the deradicalization program … Sometimes we felt threatened.” (H, A participant in an FGD). “I was born in a religious environment. You know who my brothers are … The Bali bombing was pretty funny, before the bombing the driver was learning to drive …But I had an inner conflict then … because the camouflage is excessive, we had to paint our hair, that is not Islamic, it’s over-camouflage if I say so … The moment that change me is when I was finally caught and then seeing my brother tied like that, it pains me to see it. I was so sad. There was a sort of crisis in my soul, after that I thought that my comrades and I had took a wrong step, wrong strategy, so finally I want to help the police. Once I commit, I’m committed. I’m not the type of person that goes back and forth when I say something. I am consistent, even when I am called infidels by my comrades. But every time I see a bombing victim, it breaks my heart, I feel concerned and regretted the action of me and my comrades.” (A, A participant in an interview). All participants agree that sincerity and generosity by others including law enforcement, civil society members, and practitioners becomes the key factors in changing the behavior of terror actors, therefore these are required in designing behavior shaping and transformation process. “If people what to change the brothers they must understand how the brothers are, what is important to them is sincerity. Like Mr X (one of the head of Special Detachment 88), he is a good person, sincere, and immerses in the life of the brothers so we all respect him” (K, A participant in an FGD). “If they hold deradicalization program just to get points, take credits, or to fulfill a requirement, then it is difficult...There’s no will then.” (T, A participant in an FGD). The matrices of critical areas of development needed in rehabilitating Indonesian terror activists indicate that four major aspects are crucial in transforming behaviors of activists. Table 3 illustrates critical areas of development suggested by participants. According to six participants from mixed categories, personal development for terror activists in rehabilitation can be performed individually or by grouping them according to their interests and levels of hierarchy in group, therefore initial needs assessment is needed. Specifically at the individual level, needs analysis for every participant requires survey and focused analysis of every individual’s profile (tailor-made assessment). “It’s not possible, the brothers cannot be all counseled in the same way. We are all different. Some have talent as mechanic, some like livestock, some like to cook, some like workshop. It is ridiculous that all brothers are ask to be waiters or cooks, it does not match their talent, it is a waste of money” (E, A participant in an FGD). “There are some people that are suitable joining Mr Y’s (one of the trainer) training but there are many that are not suitable. Because not all of the brothers want to be an entrepreneur. It is ridiculous that Mr Y is the one that is continued to be called” (N, A participant in an FGD). “We really fit in with calligraphy training here, but every prison is different. We are interested in calligraphy and marketing” (T, A participant in an FGD). “The Anti-terror agencies sometimes just don’t understand, the brothers are grouped together to join the same training. When in fact people are different, and we have all kinds of background, some understand Islam, some are leaders, some are junior, so we cannot be mixed ...” (P, A participant in an FGD). “Each counseling must be different, there must be a survey first, it must be observe first. Each person has a special case. I myself need capital to build a cooperative. The santri (Islamic student) need development in their economic and data entry ability in the modern cooperative system. Nyantrek Ma’am, religious study while comprehending economy and how to take care of the family finances” (U, A participant in an interview). Survey and need analysis of the development participants, according to 80% of participants from mixed categories, need to be conducted prior to the implementation of the development program to identify motives and roles of inmates in the act of terrorism. This is for conducting proper type of therapy (e.g. method, material, and approach) so that the development programs will achieve effective results in changing behavior of rejecting violence. Initial assessments should include matters such as personality profile, kinship profile, education background, knowledge about religious teachings, and socio-economic condition and status. It should also be performed by experienced terrorism practitioners. “Rather than wasting money and energy, it is better if the needs of the brothers are assessed first.. counseling and training can actually become a waste of time and cost. Especially when there is a brother with talent in automotive but asked to cook or become a restaurant waiter… of course he doesn’t want to?? It must be studied very carefully, ma’am..” (H, A participant in an interview). When asked about important points as basic principles in rehabilitating terror activists, 93% of participants explain about the importance of facilitators’ knowledge about religion teachings. Moreover, empowerment of participants becomes another key element in rehabilitation. the other nineteen key elements in rehabilitation are humbleness of counterterrorism practitioners, humanism, positive intention in performing rehabilitation, sustainable long-term technique, cultural approach, collaborative work among entities, empathy, intensive handling, sincerity, wittiness, patience, commitment, realism, consistency, respect, structured, integrity, wisdom, and creativity as presented in Table 4. “The Anti-terror people must understand Islam.. if not then it is difficult..” (J, A participant in an FGD). “Frankly, if we are idle and jobless we become curious of what our brothers are doing in Syria. That’s why we need to be occupied, must be busy, if not then we will start thinking of negative things…” (S, A participant in an FGD). “I like Mr S (one of the anti-terror practitioners).. he is humble and treats us like a human, humanist… even if he is non-Islam but he is a good person, humble, unpretentious, and friendly… not arrogant” (J, A participant in an interview). “That’s the thing, there is no coordination here.. So the brothers that have changed and repented must be sent to employment agencies, it needs coordination between agencies… so they may be accommodated in good hands and in a sustainable program.. not just counseling for 3 days or a year and then left just like that..” (S, A participant in an FGD). When discussing about proper steps in rehabilitation, three participants outside prison in several FGDs explain that rehabilitation should cover the following steps: (1) Preparation stage, including setting up objectives of rehabilitation, survey and data collection, information analysis and verification, initial assessment and need analysis, detail arrangements of rehabilitation, risk analysis and management, coordination with relevant parties, preparing inmates or rehabilitation participants, and preparing trainers or resource persons; (2) Implementation stage, including general development activities (e.g. character building, basic economic skill, self-empowerment) and specific development activities (e.g. religion teachings, carpenter skills, anger management skills); (3) Follow-up stage, which includes continuous counseling, silaturrahmi (discussions or dialogues), evaluation of the success of the rehabilitation, getting feedbacks for improvements, and community engagements or services. According to these participants, targets of the follow-up stage are inmates who support ethics and social norms, show positive attitude, and show readiness to rejoin with the broader community. It aims to maintain any improvement that has been achieved by inmates or former terror activists. Furthermore, the purpose of this last stage is to solidify rehabilitation results of inmates, evaluating whether they can truly adjust themselves in the community, and see whether the community want to accept their presence. “In our opinion… there must be a survey first, and then observe, what is their need, how to develop them, study them first, the condition of the brothers is all different.. then train them according to their preference and talent.. then there should be a continuation such as continued accompaniment, don’t just leave, it is useless…” (C, A participant in an FGD). “Follow up is necessary… because we can learn from it, and we see, how is the attitude of this brother, it is good for the Anti-Terror Agency so no money is wasted… also to see if this brother can reintegrate with the society in his village … it is a pity if he is stigmatized, difficult to progress” (T, A participant in an interview). “Counseling of terror inmates is different than other inmates, we are jihadist… different than other inmates… we are the people that strive toward monotheism, establishing the religion of Allah.. so it is not arbitrary… if they want to counsel me, then just point me in a positive direction, such as economic jihad… and rejecting violence.. that’s how… don’t try to change our spirit of monotheism or jihad… but change for example, our view of Indonesia as a war field, into a field of syiar and missionary endeavor… there are lots to be develop.. such as establishing cooperative in Islamic boarding school or school area… educate the brothers so they care about others, good non-Muslim… as well as understanding the surrounding environment …” (U, A participant in an FGD). “These brothers still need continuous counseling… the same for both of those in the prison as well as outside.. need to be accompanied and educated continuously.. ther are ummah (Islamic people) …” (T, A participant in an FGD). Specifically, in terms of rehabilitation outcomes, participants from mixed categories explain that successful rehabilitation can transform its participants so they are (1) able to re-integrate with broader community (74% participants); (2) accepted by society or not stigmatized (9%); (3) restored to previous condition before joining terrorism activities (21%); (4) able to have new life skills derived from rehabilitation process (42%); (5) able to admit their past mistakes (19%); (6) able to become self-critical (7%); (7) able to understand context of Indonesia (77%); (8) able to understand fiqh ul-waqi’ (mental calculation) (16%); (9) able to accept Indonesian local wisdom (12%); and (10) able to start a new life (7%). Moreover, in terms of objectives, 40 participants from mixed categories state that successful rehabilitation should emphasize good will or virtues instead of any political interest. In term of procedures, five participants in serial FGDs explain that successful rehabilitation should allow two-way positive dialogue in which source persons of rehabilitation show willingness to listen and respect to rehabilitation participants’ opinions and ideas. It should also allow feedback from all participants. According to them, one-way type of dialogue and oppressive type of methods such as intimidation, pressure, or threats, will bring a negative impact to the rehabilitation process and potentially will lead to hatred and implosive anger or acts of revenge in the future. Further, in terms of material, modules of rehabilitation can be diverse depending on participants’ interests and needs, yet it must be in line with Islamic philosophy and principles. “The visit to Nusa Kambangan did not succeed… instead the rejection of the program after the visit increased… because it is a one way dialog, the brothers don’t want to hear that…?” (J, A participant in an FGD). “What is important is those dialogues are two ways..” (A, A participant in an interview). “Well, I heard that in Nusa Kambangan the ustad sat above, dictating (the brothers) in his talk, so the brothers walk out… now inviting the brothers to a dialogue is difficult, because they still remember being dictated to.. it should have been according to Islam .. like Rasul’s dialog is two ways … not acting like a teacher… I’m also hesitant if I listen to a person but the person does not want to hear what I say… “ (H, A participant in an interview). In discussing about parameters of effective deradicalization in the soft approach to handle terrorism in Indonesia, most of participants (95% participants from mixed categories) describes their skepticism towards any change in religious activists’ ideology which tries to establish tauhid (fundament of Islamic teachings), perform jihad (struggle), build ima’amah (global Islamic leadership), and apply shari’ah (Islamic law). In participants’ opinions, these four concepts are unchangeable in all jihadists’ mind. “Talking about parameters, it is impossible to change our goals, we will continue monotheism and jihad, what can be done is to make the brothers pro anti-violence” (J, A participant in an FGD). “Deradicalization is a waste if the goal is to make the brothers to lose their faith again or letting go of tauhid, jihad, khilafah, and sharia” (G, A participant in an interview). When reviewing present-day practice of deradicalization in the country, 90% participants from mixed categories consider that most deradicalizations designed with political motives are not quite effective. The programs need a number of improvements as they are conducted in a short period of time, less supported by knowledgeable resources, and viewed as ‘hit-and-run’ projects. Moreover, all participants explain that most religious terror activists find the term ‘deradicalization’ irritating as it contains labeling, thus no jihadist want to join openly when it is socialized. “In my opinion, the word ‘deradicalization’ is not good… the brothers become adverse to those programs… I joined the deradicalization program but where’s the result? I’m like this (out of the prison) not because of deradicalization, but because of my own thought, now my target is to go to school” (U, A participant in an interview). According to five participants outside prison, at least three things can be achieved through deradicalization: to change jihadists’ view about the context of Indonesia which is in a state of peace, to educate jihadists to be more self-critical, and to have courage to say “No” to violence. Further, five participants outside prison in a series of FGDs describe a range of parameters of effective deradicalization from the most feasible to the most difficult to achieve: (1) openness; (2) critical thinking; (3) a sense of contexts of daar al harb (state of war) and daar as salam (state of peace); (4) empathy to terrorism victims; (5) disengagement from violence; (6) self-empowerment; (7) continuous learning; (8) adjustment to broader society; (9) social re-integration; (10) mental independence (e.g. avoiding blunt obedience); (11) tolerance to outgroup; (12) good relationship with heterogeneous members of society; (13) understanding local wisdom; (14) citizenship; (15) bravery against group pressure; (16) promoting anti-violence messages publicly; (17) endurance in promoting anti-violence messages to society; and (18) inspiring youth to become change agents in promoting anti-violence messages in the country. In their opinions, achieving openness to people outside jihadi group is not easy yet it is still possible. On the contrary, inspiring youth to become change agents in promoting anti-violence messages in mass or online media or forums is the most difficult although some of former terror activists have achieved this stage. “My suggestion is the deradicalization is use to transform the jihadists’ view about the context of Indonesia that is an arena of dakwah or education, then invite the brothers to be self-critical and have the courage to say “No” to violence” (R, A participant in an FGD). “Our experience is that it is easier to open up to people outside the jihadi circle, even if it is somewhat difficult… but at least it is still possible… then thinking critically of what is taught by our imam, learn of the surroundings, is Indonesia in daar al harb or daar as salam, learn the context and understand the difference. After that have the heart or concern for the bombing victims, they are also Muslim, then disengagement from violence. We need empowerment, so we can move on and learn new things. Because we need adjustment to broader society after release from prison. Deradicalization is good if it is successful in performing social re-integration… Now our brothers are learning to be independent, so stop to intermittently ask the teacher, we no longer have a teacher.. it used to be Ustadz Abu… when we were still in JI…” (N, A participant in an FGD). “After we are able to establish a new life and especially during this period of presidential election we try to be tolerant … to other group and try to foster relationship with heterogeneous members of society… we feel local wisdom as Indonesian is useful ma’am.. learning tolerance… we learn to become good citizen and courageous when there is group pressure … What is most difficult is to appear before the public … I’m not brave to do it now, but I support things or programs promoting anti-violence messages. We are willing to help the young generation and educate them to become change agents in promoting anti-violence messages in the country” (A, A participant in an FGD). “What is achieved by X is difficult, he has the courage to speak in a youth forum to become a change agent in promoting anti-violence messages, but careful from riya (self-glorification) because this is being shot by the media…becoming an artist, a celebrity...” (F, A participant in an FGD). This study has identified five major findings concerning terror activists’ behavior transformation process in Indonesia, critical areas of development needed in changing terrorism perpetrators’ behaviors, key elements in rehabilitation, criterions for successful rehabilitation, and parameters of effective deradicalization. The study is important as it provides former terror activists’ points of view regarding the success of rehabilitation and deradicalization based on their first hand experiences in disengaging from violence and criminal activities. The study provides points of suggestions for future improvement for practitioners in rehabilitating terrorism perpetrators. Regarding behavior transformation process, the research indicates that the process of mind adjustment may vary at the individual level yet follows a general pattern of ideology modification brought on by Rambo (1993). The pattern involves seven variables which are background context, interaction, question, crisis, encounter, commitment, and consequences. Furthermore, the study describes that interaction with outgroup or even perceived enemy can create shocks and potentially lead to crisis or self-questioning. In this point, a behavior transformation may begin or be initiated. Further, commitment can lead to pleasant or undesirable consequences. The findings need further research on whether negative consequences when carrying out behavior transformation can ever lead or correlate with any regression including recidivism, and whether unpleasant consequences such as group intimidations or threats can improve coping mechanism and personal capacity in disengaging the self from violence. Triggering factors which act as crucial turning points of terror activists in changing their behaviors and strategies are revealed in this research. The finding supports Hwang and Villarosa’s (2011) study about disengagement process that includes de-legitimizing violence, countering the message that justifies violence (by important interlocutors who can appeal to the potential recruits), and providing positive constructive alternatives. As Hwang in Hwang and Villarosa (2011) elaborates, former terror actors in Indonesia went through various disengagement processes: (a) migrated from active to non-active role; (b) migrated from jihad centric to dakwah centric role; and (c) migrated from supporting terror action to dakwah centric or non-active role. Regarding critical areas of development, the findings of this research show that there are six dimensions of critical areas needed in rehabilitating inmates charged with terrorism case: contextual insights, vocational skills, spiritual maturity, personal skills, social skills, and domestic skills. The lists of critical areas such as showing positive attitude to others, acceptance, capable of working with heteregenous people, social adjustment skills, understanding basic social ethics and norms, empathy toward others, critical thinking, open mindedness, self-introspection (admiting self mistakes), compassion toward others and natural environment, inspiring others to promote harmony, showing wisdom as in the fundamental philosophy of Islam, being positive role model for family, critical thinking, and so forth, support a number of studies that explain the root causes and motives of terrorism which are linked to various variables such as rationalization (Wolf & Frankel, 2007; Putra & Sukabdi, 2014; Kruglanski & Fishman, 2009; Post, 2007; Lia & Hegghammer, 2004; Sanadjian, 2006), understanding of Quranic verses and as-Sunnah (Putra & Sukabdi, 2013), belief in establishing Islam peacefully (Putra & Sukabdi, 2014), and exclusion (Toffler, 2006). Moreover, further research is needed to figure out critical areas of development needed for each layer of activists or level of criminal involvement in order to provide further explanations. 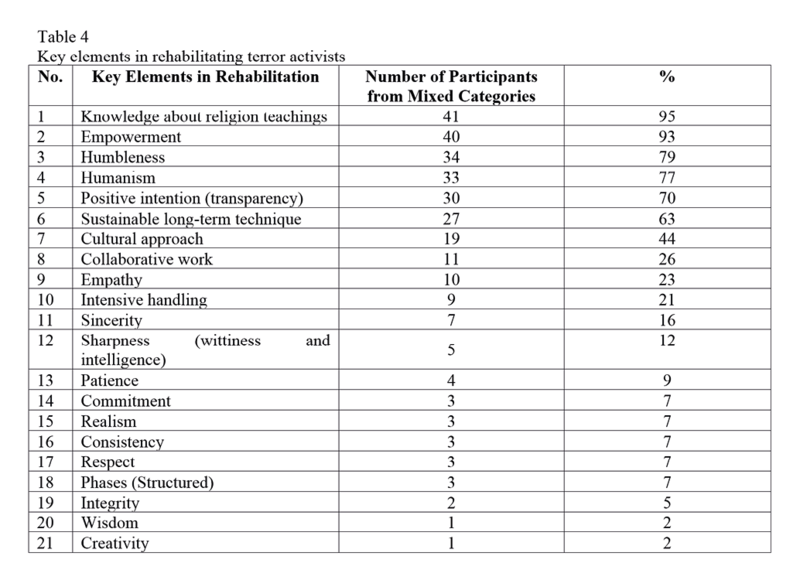 The study reveals key elements, which were explained by former terror activists, as contributors to rehabilitation. The key elements include humanism, positive intention (transparency), sustainable long-term technique, cultural approach, collaborative work, empathy, intensive handling, sincerity, sharpness (intelligence), patience, commitment, realism, consistency, respect, phases (structured), and integrity. These elements can be set as basic principles in the soft approach to terrorism perpetrators to answer the dilemma presented by Istiqomah (2011) about the issue of terrorism activists’ decisive behaviors. Regarding criterions of successful rehabilitation, the research shows that successful rehabilitation requires some qualities such as community re-integration, less stigmatization, restoration to the previous condition, skills improvement, self-introspection, self-criticism, context understanding, better mental calculation, accepting local wisdom, and mental progress. These findings supports Putra & Sukabdi’s (2014) suggestion about the use of ‘peripheral route’ in disengagement which focuses on applying positive psychology in developing quality of life such as level of education and socioeconomic and in increasing internal locus of control (for locus of control, see Rotter, 1954). Moreover, the findings in this research are based on former terror activists’ points of view which tend to support ‘inclusiveness’ in rehabilitation. The method allows terror activists to meet heterogeneous people and to mix with other types of inmates at prisons. In relation to this matter, further research from different points of view are recommended to assess the effectiveness of inclusiveness versus exclusiveness in treating various terrorism inmates in Indonesia due to the rise of cases of terrorism recruitment at prisons. Regarding parameters of effective deradicalization as a central route focusing on counter-ideology based on careful interpretations of verses of sacred texts (Putra & Sukabdi, 2014), the study found skepticism towards any change in religious activists’ ideology that links to tauhid (fundament of Islamic teachings), jihad (struggle), ima’amah (global Islamic leadership), and sharia (Islamic law). Hence, any attempt to change terror activists’ belief that connects with these concepts will potentially meet complications. The findings of this study emphasize the sense of context (daar al harb versus daar as salam) as a critical variable or ‘entry point’ to facilitate behavior modification, thus it is recommended to be included in any attempt of central route. Lastly, there is also a finding concerning the controversy of the term ‘deradicalization’. Further research concerning a broader view related to the terminology need to be explored in order to give more inputs for implementation of deradicalization by researchers and practitioners. About the author: ZORA A. SUKABDI is a psychologist from University of Indonesia and currently is a Phd Candidate at Swinburne University of Technology, Australia. She has extensive expertise in rehabilitation at prisons in Indonesia, and also contributes in formulating the National Guidelines of Re-education and Re-integration. She is currently acting as the Head of Re-Education and Re-Integration Department in Indonesian Institute for Society Empowerment (INSEP) and the Director and Founder of Global Center of Well-Being (GeoWB), Indonesia. She received Allison Sudrajat Prize for her dedication in humanitarian activities in 2014. Her research interests include Psychology of Terrorism, Radicalism, Positive Psychology, Organizational Psychology, Community Policing, Peacekeeping, Social Reconciliation, Forensic Psychology, Wellbeing, Criminal Studies, Capacity Building, and Human Resources. Amrozi. (2010). Prison and Paradise. Documentary Film. Dubai: Dubai Film Festival. Bandura, A. (1999). Moral disengagement in the perpetration of inhuminities. Personality and Social Psychology Review, 3, 193-209. Bandura, A. (2004). The role of selective moral disengagement in terrorism and counterterrorism. In F. M. Moghaddam, & A. J. Marsella (Eds. ), Understanding terrorism: psychological roots, consequences, and interventions (pp. 121-150). Washingto DC: APA Press. Berne, E. (1976). A Layman’s Guide to Psychiatry and Psychoanalysis. Middlesex. Fenichel, O. (1946). The Psychoanalytic Theory of Neurosis. London: Routledge. Fenichel, O. (1999). The Psychoanalytic Theory of Neurosis. London: Routledge. Freud, A. (1937). The Ego and the Mechanisms of Defense. London: Hogarth Press and Institute of Psycho-analysis. Freud, S. (1991). Jokes and Their Relation to the Unconscious. Harmondsworth: Penguin. Ghufron, Ali. (2010). Prison and Paradise. Documentary Film. Dubai: Dubai Film Festival. Green, P. (1974). Juvenal: The Sixteen Satires. Middlesex: Penguin. Horgan, J. (2008). From Profiles To Pathways and Roots To Routes: Perspective From Psychology On Radicalization Into Terrorism. The Annals of the American Academy of Political and Social Science, 618(80), 80-94. Imron, A. (2007). Ali Imron, Sang Pengebom. Jakarta: Penerbit Republika. Istiqomah, M. (2011). Deradicalization Program in Indonesian Prisons: Reformation on The Correctional Institution. Malang, East Java: University of Brawijaya. Kaplan, H. I., Sadock, B. J., Grebb, J. A., & Kaplan, H. I. (1994). Kaplan and Sadock’s Synopsis of Psychiatry: Behavorial Sciences, Clinical Psychiatry. Baltimore: Williams & Wilkins. Kruglanski, A. W., & Fishman, S. (2009). The Psychology of Terrorism: “Syndrome” Versus “Tool” Perspectives. Terrorism and Political Violence, 18(2), 192-215. Kurzman, C & Engelhart, N. (2006, 31. October), Welcome To World Peace, the Christian Science Monitor, Localized 13. March 2014, on www.csmonitor.com/2006/0830/p09s02-coop.html. Maddox, B. (2007). Freud’s Wizard: Ernest Jones and the Transformation of Psychoanalysis. London, MA: Da Capo Press. Moghaddam, F. M. (2006). From The Terrorists’ Point of View: What They Experience and Why They Come To Destoy. Connecticut & London: Praeger Security International. Moghaddam, F. M. (2008). How Globalization Spurs Terrorism: The Lopsided Benefits of “One World” And Why That Fuels Violence. Wesport: Praeger Security International. Moghaddam, F. M. (2009). Omniculturalism: Policy Solutions to Fundamentalism In The Era of Fractured Globalization. Culture & Psychology, 15(3), 337-347. Mufid, A. S., Sarwono, S. W., Syafii, M., Baedowi, A., Karnavian, T., Zarkasih, M., . . . Padmo, A. (2011). Research on Motivation and Root Causes of Terrorism. Jakarta: Indonesian Institute for Society Empowerment. Pech, R. J., & Slade, B. W. (2006). Religious fundamentalism and terrorism: Why do they it and what do they want? Foresight: The Journal of Future Studies, Strategic Thinking and Policy, 8, 8-20. Peterson, C., & Seligman, M. E. (2004). Character Strengths and Virtues: A Handbook and Classification. Washington, DC: American Psychological Association. Phillips, A. (1994). On Flirtation. Cambridge, MA: Harvard University Press. Post, J. M., Sprinzak, E., & Denny, L. M. (2003).The terrorists in their own words: Interviews with 35 incarcerated Middle Eastern terrorists. Terrorism and Political Violence, 15, 171-184. Putra, I. E., & Sukabdi, Z. A. (2013). Basic concepts and reasons behind the emergence of religious terror activities in Indonesia: An inside view. Asian Journal of Social Psychology, 16, 83-91 doi: 10.111/ajsp.12001. Putra, I. E., & Sukabdi, Z. A. (2014). Can Islamic fundamentalism relate to nonviolent support? The role of certain conditions in moderating the effect of Islamic fundamentalism on supporting acts of terrorism. Peace and Conflict, 20, 583-589. Riggar, T. F., & Maki, D. R. (Eds.). (2004). The Handbook of Rehabilitation Counseling. New York: Springer Publishing. Rose, J. D. (1982). Outbreaks, the sociology of collective behavior. New York: New York Free Press. Rotter, J.B. (1954). Social learning and clinical psychology . NY: Prentice-Hall. Sanadjian, M. (2006). Fear, terror and the new global economy of salvation: Global excess and ‘suicide’ bombing in London. Social Identities: Journal for the Study of Race, Nation and Culture, 12, 701-725. Shihab, M. Q. (2008). Kekerasan Atas Nama Agama: Meluruskan Kesalahpahaman Seputar Konsep Perang dan Jihad dalam Islam. Jakarta: Pusat Studi Al-Quran. Sterne, L. (1967). Tristram Shandy. Middlesex: Penguin. Taylor, M., & Horgan, J. (2001). The psychological and behavioral bases of Islamic fundamentalism. Terrorism and Political Violence, 13 (4), 37-71. The National Anti-Terror Agency. (2013). National Rehabilitation Guidelines for Terrorism Perpetrators and Families Volume 1. Jakarta: The National Anti-Terror Agency. Toffler, A. (2006). The confusion bombs. In: P. Katona, M.D. Intriligator & J. P. Sullivan, eds. Countering terrorism and WMD, xi-xxv. London and New York: Routledge. Victoroff, J. I. (2009). Psychology of Terrorism: Classic and Contemporary Insights. New York: Psychology Press. Victoroff, Jeff. (2005). The Mind Of The Terrorist: A Review And Critique Of Psychological Approaches. Journal of Conflict Resolution, 49, 3-42. Walker, I., & Smith, H. J. (2001). Relative Deprivation: Specification, Development and Integration. Cambridge: Cambridge University Press. Wolf, Y., & Frankel, O. (2007). Terrorism: Toward an overarched account and prevention with a special reference to pendulum interplay between both parties. Aggression and Violent Behavior, 12, 259-279.